Kylemore community crafters make a beautiful range of homeware. Our design inspiration is found in the country lifestyle of the area and the beautiful images, textures and colours that is Africa. Please contact us to place an order or to request further information. Moses first came to me to ask me to work with him here at Imbali. I said ‘only with pleasure’ and the very next morning I was here. 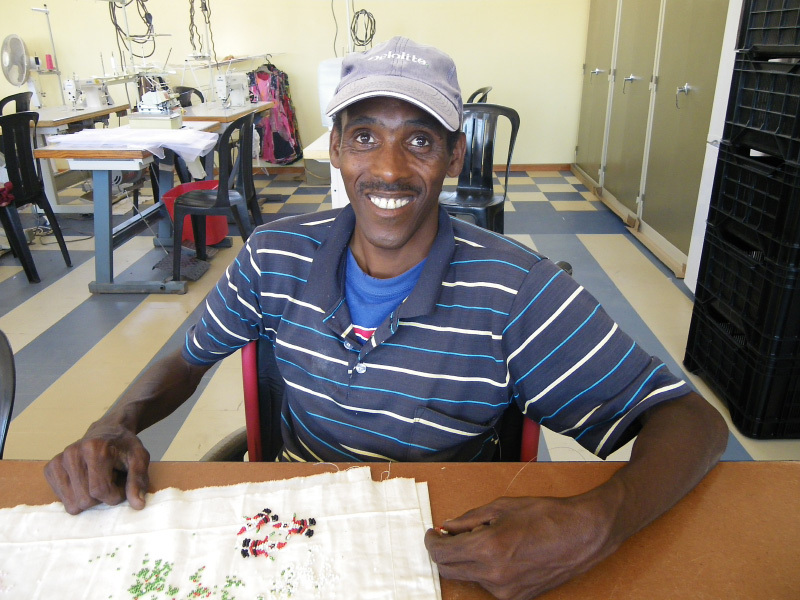 He has taught me to do beadwork, and I am so grateful to have a job like this. I come here on my own everyday, but when the weather is very bad, I have to stay at home because I can’s get the wheelchair here. At school I made the wrong friends, and was stabbed with a knife which has left me partly paralysed. So it has always been very hard to find work. After my parents died, I was quite helpless and came to live with people here in Kylemore. But my disability grant is very little and it was a struggle to survive. Now I live with my wife’s parents, come to Imbali during the day, and appreciate this wonderful community of friendly kind people. I never want to leave here.